Does anyone has experience with the wool overcoat from Goodfellow & Co featured today in the main page? I'm worried about the fit and how padded the shoulders might be (returning it is no option, that's why given that it would be my first overcoat it seems like a "safer" bet than more expensive jackets). Just as a reference I wear 34 in SS jackets or 36 in Ludlows, and Target only carries Small (not XS). Probably too late to help but I've got the Goodfellow wool overcoat. I think it's a good buy for $79. The shoulders are padded but not heavily. I'm a 40 in SS and most other brands and the Medium fits me just about perfectly. Tough call on whether the Small would be small enough for a 34/36 though. Why is returning it not an option for you? Target's usually good about returns. Can anyone recommend a good sweater brush or comb? I recently thrifted a POLO cashmere sweater, and the thing is pilling itself to death, especially in the armpits. Thanks! For cashmere, you'll want a pig bristle brush or at least a softer bristle that is specifically meant for cashmere. Do not use a brush that is not meant for cashmere as you're asking for trouble. Brand doesn't matter, I suggest googling around for something that won't break the bank as cashmere-specific accessories can cost more than a cashmere sweater. As for the pilling, no brush is going to fix that if it's severe. Set aside an hour of your life, grab a razor blade and tweezers, and *carefully* remove the pills from the surface one by one by lightly pulling the pill off the surface with the tweezers and then shearing it off with the blade. It's a zen experience and once you're done you'll actually have an even softer sweater. 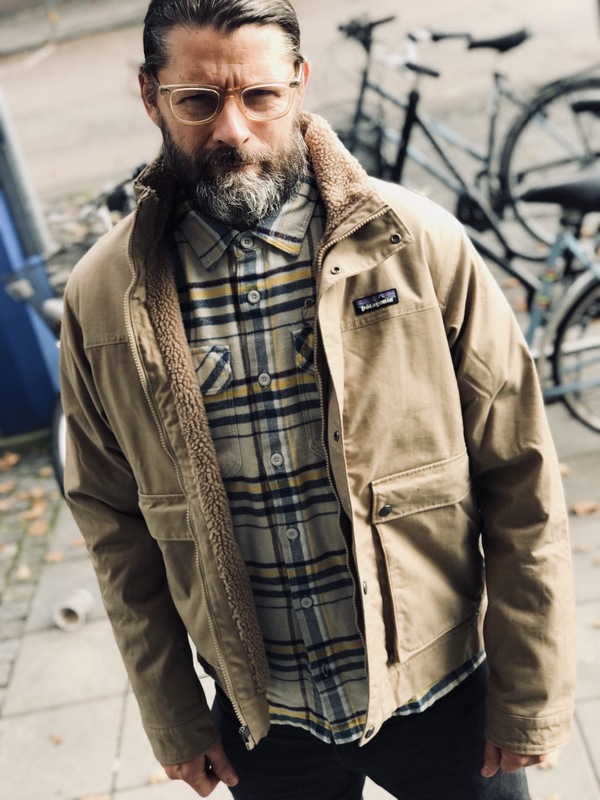 Quick question that will probably open up pandora's box, but as a recent transplant to Minnesota, how do I found a jacket that will keep me warm in sub-zero temps that doesn't make me look like I'm climbing Mt Everest? I recently bought a Fjallraven Greenland Winter Jacket and gave it a whirl when it was 15 degrees and it didn't hold up at all (with a cotton henley and merino sweater underneath). I'd really like the waxed canvas, workwear style jackets both aesthetically and functionally (I do a lot of woodworking and manual stuff around the house). Here's a couple of inspiration photos I dug up (Fjallraven greenland and Patagonia maple grove, respectively). Looking for some advice on leather jackets: I want to pick up a racer-style leather jacket during this holiday season (Black Friday or Boxing Day), something in the CAD $300 - $400 range. Not sure how the quality or value on this is, any advice or additional options would be helpful. I need navy grenadine tie. This will be my goto tie for now. Do you recommend 3.0" or 3.5" (standard)? Also, which brand you guys like, its a very expensive tie. Unless you are unusually short and slender I would opt for a standard width. (For reference I am 5’9”, ~150 lbs, 36R jacket, and wear standard width ties.) I own several Chipp grenadines and am very satisfied with them. They are a little less expensive than some of the other brands like Kent Wang. https://www.samhober.com/ you will be very happy.